Cochiti Pottery from Cochiti Pueblo - English Pronunciation: "Coh-chee-tee," Traditional Name: KO-TYIT. The Cochiti people are noted for their hospitality and friendship towards visitors who are welcomed to many of the annual ceremonies for which Cochiti is famous. Many members of the Pueblo live outside the reservation and have been acculturated into the Anglo-Hispanic community, but most of them continue their association with the Pueblo, especially during the major feast day. San Buenaventura’s Day in July. This is marked by dancing and ceremonies of traditional pattern and authentic costumes. At one time, agriculture was the primary activity of the Pueblo. Dams have been constructed to assist in the elaborate irrigation system that helps maintain the crops, but through the years, as employment outside the Pueblo increased, so agriculture decreased. The Pueblo has been more affected by contact with the majority culture than many of the other Pueblos with electricity, plumbing and above all, radio and television, which may account for the preponderance of the Anglo lifestyle in ratio to historic customs. Many of the ancient crafts have been revived, such as pottery and jewelry making which constitutes a good source of income from sales to tourists. 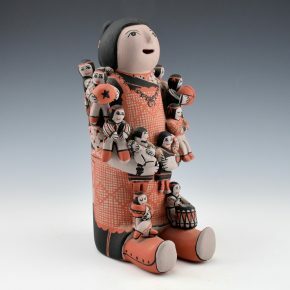 One of the most popular pieces is the Storyteller figure, which was revived in 1964 by Helen Cordero. It comprises a seated man with a number of children on his arms and lap, made of clay with vari-colored decorations. Animal figures such as turtles, birds, frogs, and lizards are also depicted. Many Cochiti artists work in watercolors, ink and oil paint and have achieved considerable fame for their innovative use of color. But the most important product of the craftsmen of Cochiti is the drum. These are made from hollowed tree trunks, mostly aspen, with leather ends laced together around the cylinder. Live trees are not cut down to make these drums, but great care is exercised in the selection of the logs. They are made by other Indians for their excellent quality and tone. There are a number of festivals and dances in June, July, and August to which the public is invited to see the traditional dances and ceremonies of the Cochiti Pueblo. Louise E. Suina (1939-1992) was known for her intricately painted storytellers. This figure has eight children who are formed and painted with activities from playing ball to playing a drum. Note as well the very intricately painted design for the apron she is wearing. The figure is signed on the bottom, “Louise E. Suina”. It is in very good condition with no chips, cracks, restoration or repair. 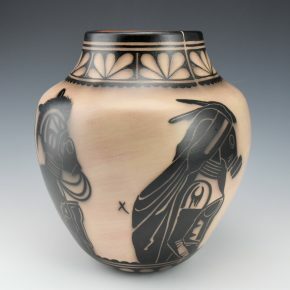 This is an exceptional jar by Lisa Holt and Harlan Reano. Working together, they make an amazing team as they create innovative pottery using traditional techniques. Lisa makes the pottery and it is painted by Harlan. This jar has a tightly painted design around the neck with modernized wild spinach plant patterns around the sides and flowering motifs on the neck. The designs on the sides are divided by a tendril or flame extension from the jar. Harlan said that they had tried it before with two bands extruding out from the piece but the four were much more difficult. The result, however, is a very cohesive appearance and flow of design and form. The materials are all traditional as the red and cream are both native clays while the black is wild spinach (a plant). The jar is traditionally fired outdoors. It is signed on the bottom. Seferina Ortiz is the matriarch of a family of renowned potters, including Virgil Ortiz, Janice Ortiz, and Lisa Holt. This is one of her animal figures. 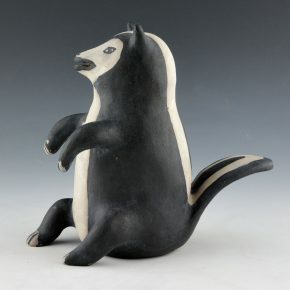 It is a clay skunk which is slipped with a white clay and the painted with wild spinach (black). The piece is signed on the bottom. It was traditionally fired and in excellent condition with no chips, cracks, restoration or repair. Definitely a charming piece by this historically important potter! Seferina Ortiz is the matriarch of a family of renowned potters, including Virgil Ortiz, Janice Ortiz, and Lisa Holt. This is one of her drummer figures. The drummer is sitting down and the drum is part of the piece. The drumstick is made from wood and leather and added after firing. 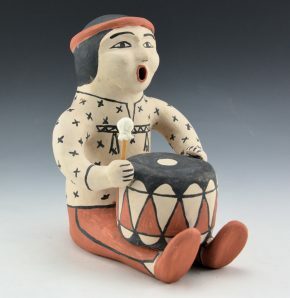 It is more charming as her husband, Guadalupe, also made Cochiti drums. The piece is slipped with a white clay and then painted with a red clay slip and wild spinach (black). The piece is signed on the bottom. It was traditionally fired and in excellent condition with no chips, cracks, restoration or repair. Definitely a classic figure by this historically important potter! 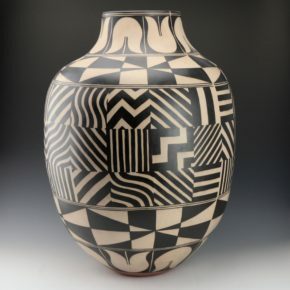 This is a striking but smaller jar by Virgil Ortiz. The piece is coil built and painted with native clay slips and wild spinach (a plant) for the black. The jar is painted with one of Virgi’s iconic images. It is that of Tahu, the Blind Archer, with a rose in her mouth. The story for this image is part of the Pueblo Revolt 1680/2180 series. Separating the two Tahu images are wildflowers, which curl and swirl up from the base of the jar. Note as well the “spirit line” which is a space in the painting on the rim. Virgil has also incorporated his signature “x”, which is the turkey track, onto the jar. The piece is signed on the bottom. It is from 2013 and it is in excellent condition with no chips, cracks, restoration or repair. 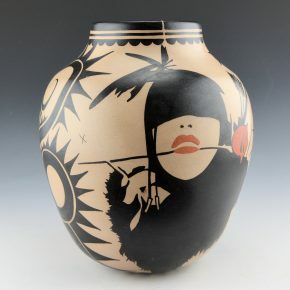 The use of traditional and contemporary imagery has become a standard for Virgil’s pottery as he pushes the boundaries of contemporary Native clay. His work can be found in museums worldwide, including the Fondation Cartier in Paris, the Heard Museum, the Denver Art Museum and more. Lisa Holt and Harlan Reano make an amazing team, working to create innovative pottery using traditional techniques. Lisa makes the pottery and it is painted by Harlan. This figure is amazing as it is hollow and all coil built. The figure is basically two columns which twist up from the base and then extend out to the arms and up to the head. The concept for these figures was from Harlan who wanted to create a series of “Pueblo Super Heroes”. The body has a series of painted swirl and lightning designs. The shape and movement are exceptional on this figure! The materials are all traditional as the red and cream are both native clays while the black is wild spinach (a plant). The figure is traditionally fired outdoors. It is signed on the bottom. Martha Arquero (b. 1944) learned to make pottery from her mother, Damacia Cordero. Her sisters, Josephine Arquero, and Maria Laweka, are also well known for their traditional pottery. This is one of her smaller figures. It is a classic style frog with a fly on its tongue. 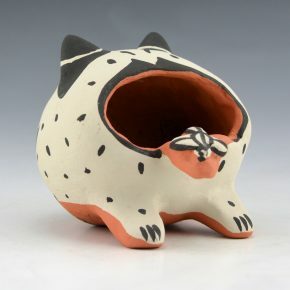 Cochiti is located on the river, and so frogs are often seen in their figurative pottery. The frog is signed on the bottom with wild-spinach on the clay. It was traditionally fired and in excellent condition with no chips, cracks, restoration or repair. 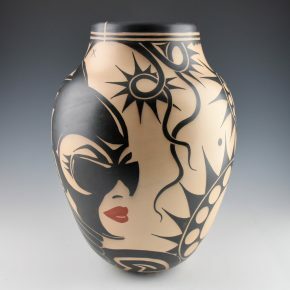 This water jar includes some of the most iconic images in the work of Virgil Ortiz. The design is taken from his Revolt 1680/2180 series. Thre are four figures representing the Pueblo Warriors from the Venutian Soldier series of his work. It is a powerful story of the connection between man and the environment. The figures are each intricately painted and inspired by photography work he did in 2012. The last photos are some of his photography for the Venutian Soldier series. While the figures are intricately painted, the space between them is left nearly blank. However, there is a turkey track which looks like an “x”, next to each of the figures, signifying their travels. The neck of the jar has a plant and cloud design. The jar shape itself is elegant with the high shoulder and short neck. The jar is made from native clay, native clay slips and wild spinach (the black). The piece is signed on the bottom. 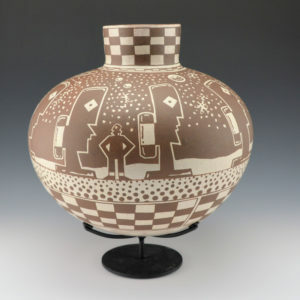 The use of traditional and contemporary imagery has become a standard for Virgil’s pottery as he pushes the boundaries of contemporary Native clay. In the summer of 2012 Ortiz premiered his “Venutian Soldiers’. The story of the Pueblo Revolt was becoming more evolved and Ortiz was able to have fun developing more background for his characters and the events before the Revolt 2180. “I have created Native Superheroes in the form of clay, photography, video and film, which allows me the freedom to express my personal interpretation of the REVOLT – The First American Revolution. The Venutian Soldiers are futurist, herculean superheroes, over eight feet tall, who fight mainly at nighttime and possess extraordinary strength and magical powers”. Here the Venutian Soldiers reflect the destruction of pueblos by the Spanish during their original conquest. In their future version, it is the Castilians who have destroyed their ‘world’ and the Venutian Soldiers are the embodiment of this devastation. Their environment has been destroyed through nuclear weapons causing the Venutian Soldiers to use oxygen tanks and gas masks to survive. This story is a thoughtful embodiment of a world overrun and the natural order destroyed yet survivable by the sense of “Pueblo community”. The Venutians are lead by Tahu and Kootz to find a hospitable land and “rebuild their traditions and ways of life on ancestral sacred lands”. 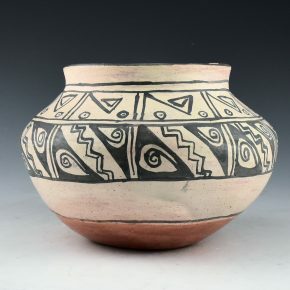 Teresita Romero is one of the great names in the revival of Cochiti pottery in the 1950-60 era. She was the grandmother or noted potter Diego Romero and painter Mateo Romero. Throughout her career she was known for her large vessels and use of traditional iconography in her work. This jar is a complex piece of her pottery. The jar has a round body and a slightly turned out neck. The jar is painted with two bands of designs. The top band is a cloud motif and the bottom is a lightning and water design. The black areas are painted with wild spinach and the red with clay slips. The red clay she used was distinctive for her pottery and had an orangish-red coloration. The jar is signed on the bottom “Teresita Romero”. The jar is in excellent condition with no chips, cracks, restoration or repair. Lisa Holt and Harlan Reano make an amazing team, working to create innovative pottery using traditional techniques. Lisa makes the pottery and it is painted by Harlan. Each piece is painted with native clays (red, white) while the black is wild spinach (a plant). They are also traditionally fired. This water jar is an elegant shape with the high shoulder and elongated neck. The piece is fully painted with a very complex and elaborate design! The imagery is based on the wild spinach plant, used for the black paint on the pottery. This plant design can be see around the shoulder and near the base of the jar. There are additional plant and lightning motifs around the surface. It’s exciting to see such a fully designed jar and with such amazing intricacy of patterns! Lisa and Harlan have won numerous awards over the years. This jar is signed on the bottom. This is one of Virgil’s traditional clay figures made from native clay and painted with native clays and wild spinach (black). The figure has been traditionally fired. As noted the Monos figures were originally created as objects of social criticism and reflection and Virgil continues on this same path in his contemporary work. This figure is made in the “old style” and as a reference check out the final image by Ben Wittick from the 1880’s. These figures were made with hollow arms and “open” hands. The mouths and eyes were also open. Here Virgil has revived those older technical forms. The designs on the figure a spinach leaf patterns on the vest and pants. The little pocket on the vest and the goatee on the figure are very reminiscent of the early Monos figures, as those were personal identifiers which were incorporated into the design. Note how deeply the black fired on this piece! The earrings are also traditional red clay and added after the firing. It is signed on the bottom and is from 2018. 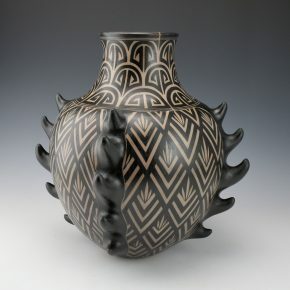 Lisa Holt and Harlan Reano make an amazing team, working to create innovative pottery using traditional techniques. Lisa makes the pottery and it is painted by Harlan. This figure is a dragon/dog. It creatively combines both a pueblo and Asian influence. The dragon is hollow and the body has a spiraling appearance. The body is complex and the various spines add an exceptional sense of depth to this piece! The turned head is just perfect! The body is painted with bee-weed (black) and a red clay slip. On the back legs is a wild spinach design. On the sides is a flower pattern. The back and legs has a mosaic lightning pattern which Harlan often uses on his pottery. The small clay tabs which are added are the natural color of the clay, adding another dimension to the piece. The materials are all traditional as the red and cream are both native clays while the black is wild spinach (a plant). This figure was also traditionally fired outdoors. It is signed on the bottom. This is a very powerful piece from Diego Romero. The title of the bowl is “Fallen Angel” and is one of the pieces Diego has created over the years touching on the impact of addiction. The painting is exceptional with a very simple figure and a very impactful statement created. The bowl itself has the flared rim and two bands of intricately painted designs. Diego was one of the potters around 1990 to break away from more classic shapes and styles of pottery. 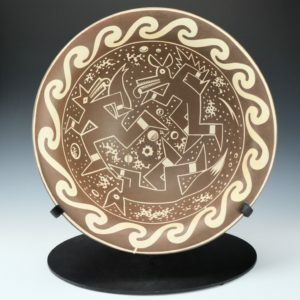 He returned to a pre-contact style of Mimbres culture (1100’s in southwest New Mexico) and was inspired by the open bowl shape. This has been his “canvas” throughout most of his career. The imagery evolves, changes and tells a narrative of his life and interests. It is signed on the rim, “Chongo Made Me, Chongo Painted Me”. The bowl is in perfect condition with no chips, cracks, restoration or repair. Click here to read more about Diego’s Imagery! 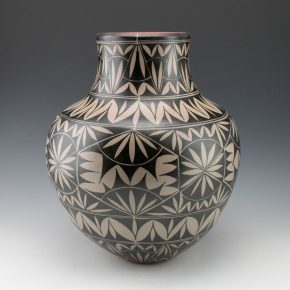 Diego Romero was one of the potters around 1990 to break away from more classic styles of Pueblo pottery. He returned to a pre-contact style of Mimbres culture (1100’s in southwest New Mexico) and was inspired by the open bowl shape. This has been his “canvas” throughout most of his career. However, he has also created a few vessels over time, which are also based on ancient shapes. This jar has a classic Chaco period form with the round body and elongated neck. 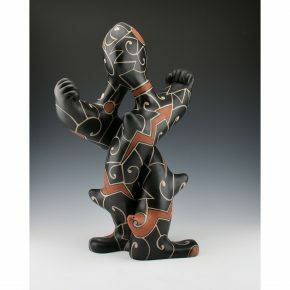 The design here is derived from his Chongo character, who populates much of the iconography of his pottery. Here, Chongo is out at night among giant Chongo heads, much like at Easter Island. Here Chongo is standing among them with coyote in the background. Note the stars at night, and maybe even a UFO!? It is signed on the bottom, “Chongo Made Me, Chongo Painted Me”. The bowl is in perfect condition with no chips, cracks, restoration or repair. The jar has a round base, so we had a metal museum mount made for it to sit on, which gives it a very modern appearance! Lisa Holt and Harlan Reano make an amazing team, working to create innovative pottery using traditional techniques. Lisa makes the pottery and it is painted by Harlan. This storage jar is a striking shape with tall sides and a slight neck. The neck and the base are painted with wild spinach plant designs. Around the center of the jar are panels with varied rain designs. Each is different than the next creating a stunning appearance as the jar is turned. The jar is stunning complexity in both form and design. The materials are all traditional as the red and cream are both native clays while the black is wild spinach (a plant). The jar is traditionally fired outdoors. It is signed on the bottom. 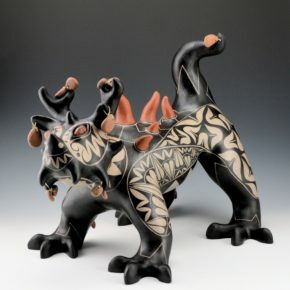 Diego Romero was one of the potters around 1990 to break away from more classic shapes and styles of pottery. 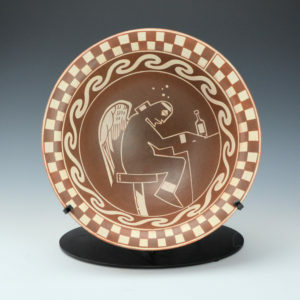 He returned to a pre-contact style of Mimbres culture (1100’s in southwest New Mexico) and was inspired by the open bowl shape. This has been his “canvas” throughout most of his career. The imagery evolves, changes and tells a narrative of his life and interests. This very intricately painted bowl is entitled, “In the Beginning“. It has the center panel there are all three of Diego’s iconic figures, Hound, Coyote and Fox. They are at that defining moment of creation, with each of them in an intertwined dance in the cosmos. The bowl is flared out and it is painted with a classic Mimbres design. It is signed on the rim, “Chongo Made Me, Chongo Painted Me”. The bowl is in perfect condition with no chips, cracks, restoration or repair. Over the past decade, Charles King has worked closely with Virgil Ortiz at King Galleries. Virgil has premiered nearly all his new series at the gallery during that time. In preparation for this book of Virgil’s work surrounding the Pueblo Revolt 1680/2180, King interviewed and worked with Virgil to help give new insight into this amazing accomplishment. The result is the first comprehensive analysis and presentation of how Virgil conceived and then brought to life his various series dealing with the Pueblo Revolt. Virgil Ortiz is an internationally renowned ceramicist, fashion designer, and graphic artist from Cochiti Pueblo, New Mexico. He uses contemporary art to blend historic events with futuristic elements. 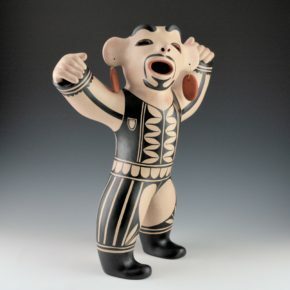 Set against Ortiz’s graphic murals, the exhibition “Revolt 1680/2180: Virgil Ortiz” features 31 clay figures and invites visitors to immerse themselves in a storyline that Ortiz created that begins with the Pueblo revolt of 1680. In addition to King’s essay, there is a spectacular forward by Herman Agoyo, who helped bring the statue of Po’Pay to the US Capitol. Peter Held, renown curator of the Ceramics Research Center, rounds out the essays with insights into how Virgil’s work fits into the modern world of ceramics. If you have always wanted to understand Virgil’s take on the Pueblo Revolt and how he has re-imagined it in the future, this is certainly the only book to give such insight. 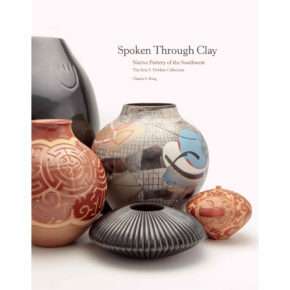 Take a moment and delve into his art and check out the amazing ceramic pieces also featured in the book! It is stunning! Hardcover, 7 ¾ x 9 in.